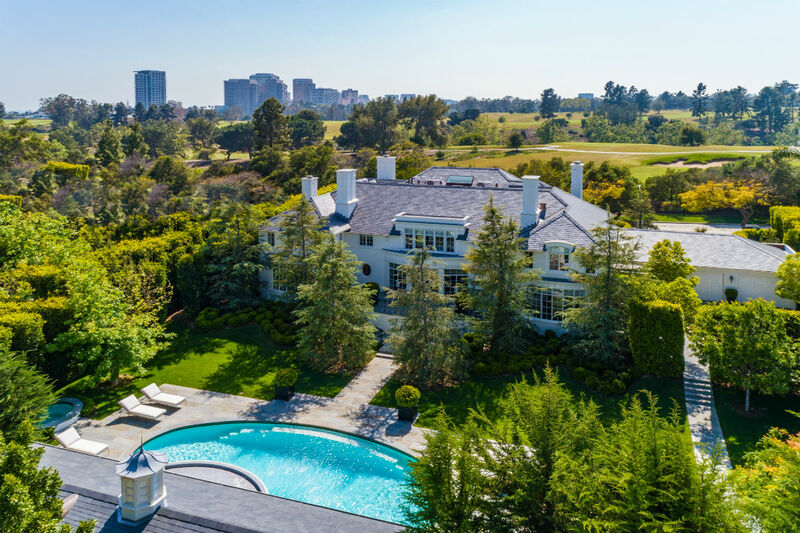 Situated in a prime Beverly Hills location directly opposite the Los Angeles Country Club, the Rutherford House makes a stately impression with its gleaming façade and expansive and well-manicured grounds that offer sweeping vistas of the surrounding cityscape. The home’s designer, Craig Wright, has taken his cue from the classic celebrity homes of architect Paul Williams, and added his own contemporary touches and flair, evoking the Art Deco and Hollywood Regency flourishes that have characterized many of L.A.’s trophy residences during the first half of the twentieth century. Previously owned by actress Ann Rutherford (remembered as Scarlett O’Hara’s sister Careen in “Gone with the Wind” and as the love interest in the popular “Andy Hardy” franchise with Mickey Rooney), the elegant Beverly Hills home that she shared with husband William Dozier (producer of the 1960s “Batman” television series) is a Hollywood classic, recently renovated and expanded by its current owners, who purchased the property after Rutherford’s death in 2012. 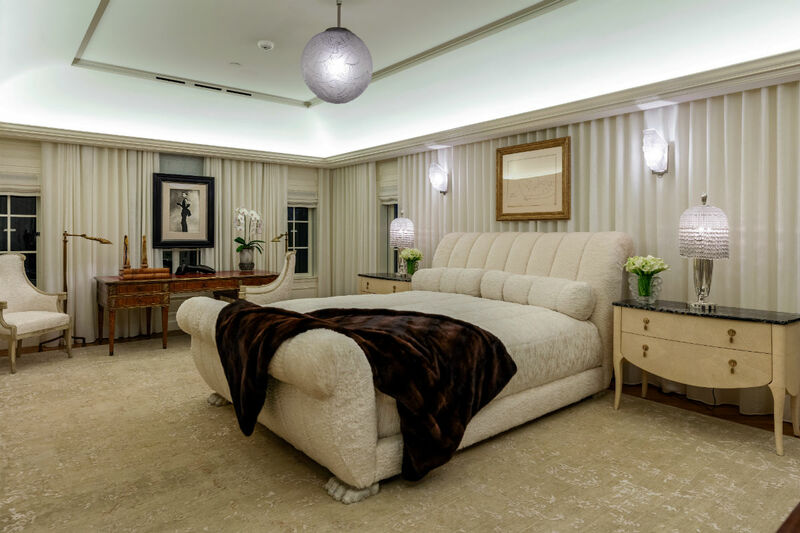 Visitors who enter the home will readily appreciate its classical pedigree, since it has been designed to reflect the traditional standards of 1930s and 1940s luxury, as embodied by Art Deco, Streamline Moderne and neoclassical aesthetics. 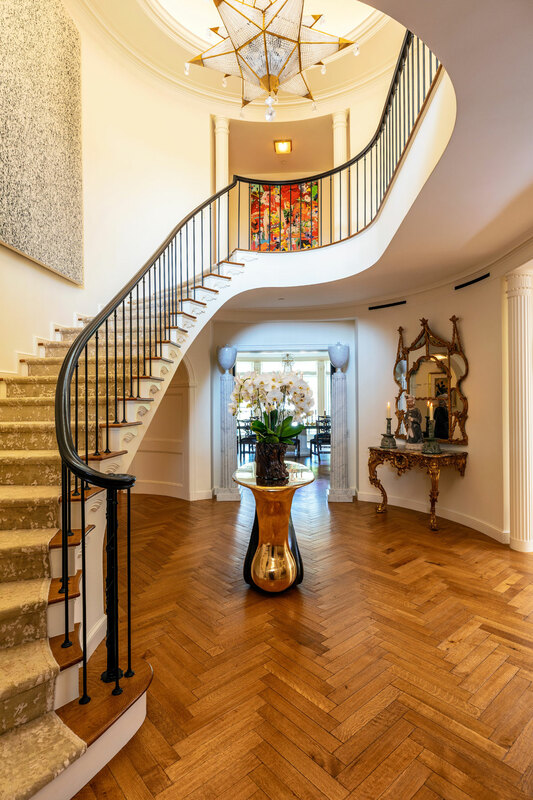 The immaculate oval foyer forms the first impression upon entering: it is distinguished by a lovely curvilinear staircase and a fine herringbone inlaid wood floor. Moving beyond, one encounters the magnificent dining room, also oval shaped, and seating up to 24 guests. 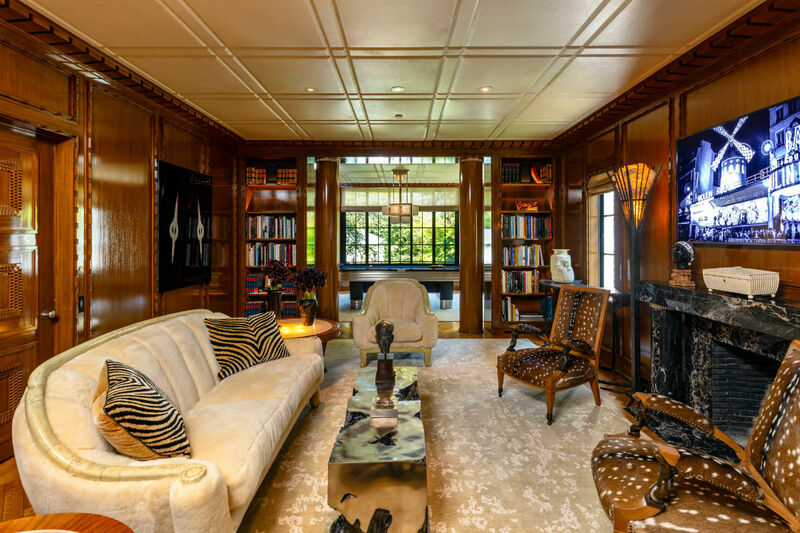 Many of its interior are the work of renowned residential designer and antiquarian Craig Wright, who has appointed the home with many fine furnishings, object of art, and Art Deco glass fixtures inspired by the first decades of the 20th century, all of which are either included or available for purchase with the home. 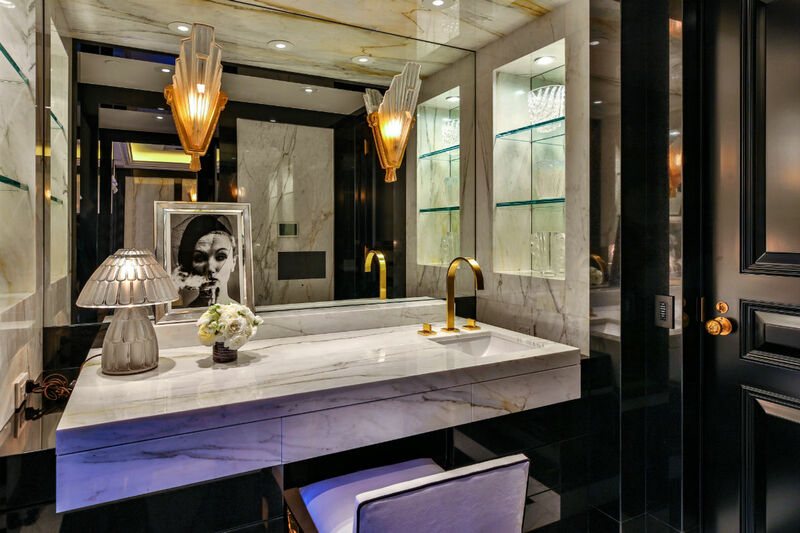 The fixtures, in particular, are truly one of a kind. The nearby chef’s kitchen has been renovated and features custom steel floors and a mosaic ceiling, with an adjacent butler’s pantry and breakfast room noted for its antique marble fireplace and stylish vintage Chinese wallpaper. Elsewhere on the ground floor, a lavish living room has been impeccably designed for comfort and intimacy, and guests will marvel at a magnificent neighboring billiards room and library/sitting room. 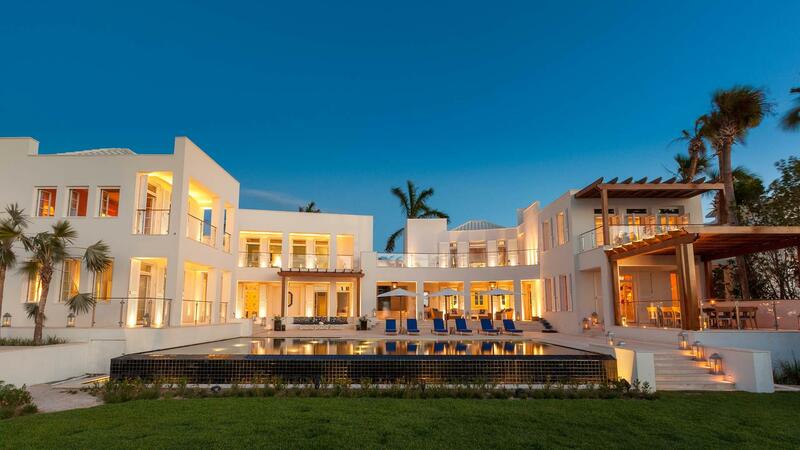 All told, the home’s square footage now stands at 10,500 square feet, making it an outstanding entertainment property. 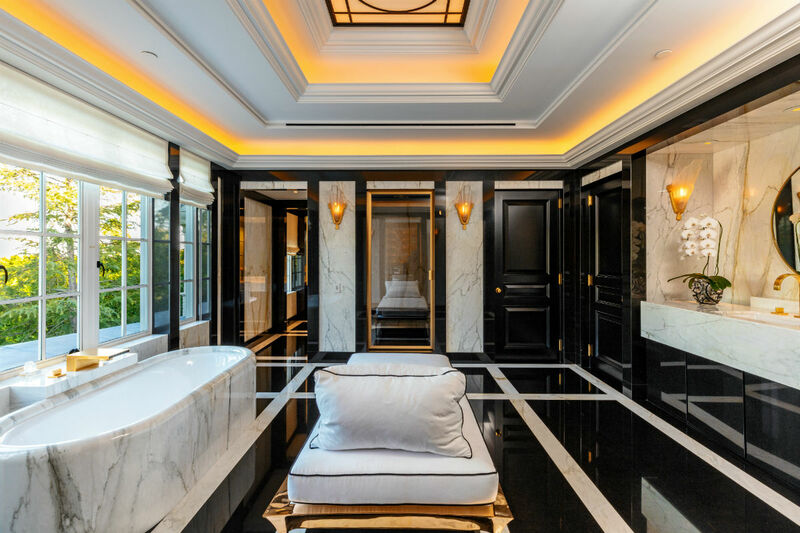 Perhaps the grandest echo of Beverly Hills’ golden age is found upstairs in the private areas of the home, where a sumptuous master bedroom displays all the hallmarks of the plush, streamlined era of the 1930s, with elegant surfaces, recessed lighting, and marble floors. Both master bedroom and bath have been meticulously renovated and reinvented to combine all the latest comforts with the look and feel of a bygone era. When Ann Rutherford co-starred in “Gone with the Wind,” her character made her home at the beloved Tara. Later in life, Rutherford found her own Tara in Beverly Hills and made it hers. 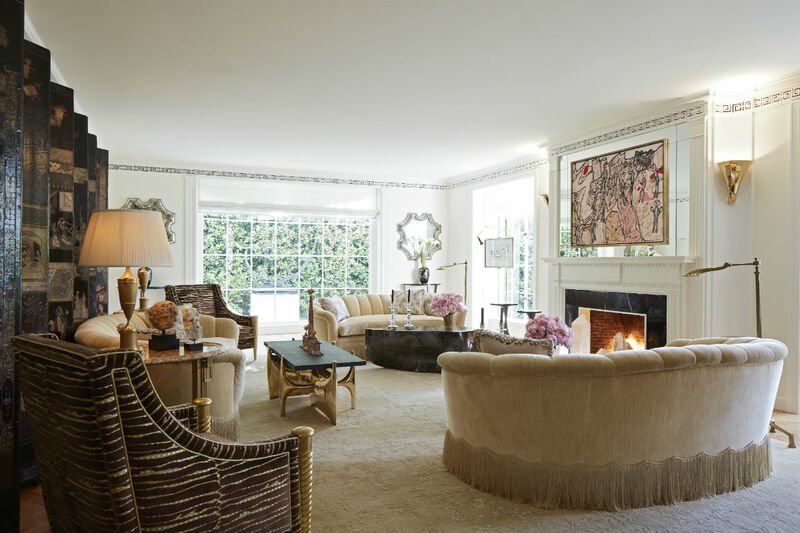 Now the Rutherford House awaits a new and worthy steward who will immediately discover that the home itself is a reinvented marquee-worthy property and an incomparable gem. Experimental Eating: Can Food be Art? Who are the Buyers Driving Luxury Property Sales? Will My Luxury Home Sell For More Than My Neighbor's? Does Luxury Real Estate Follow Trends in Luxury Assets? Should I Sell My Vacation Home in Times of Uncertainty? Is Cash Still King in Luxury Real Estate? From Tech to T.V.—Which Industries Are Sparking a Luxury Housing 'Comeback'? Who are the New Buyers of Luxury Real Estate? A Return to Realism For Trophy Property Prices? On The Beach: What Does $5 Million Buy? What Price Defines a "Luxury" Home in Your Market? 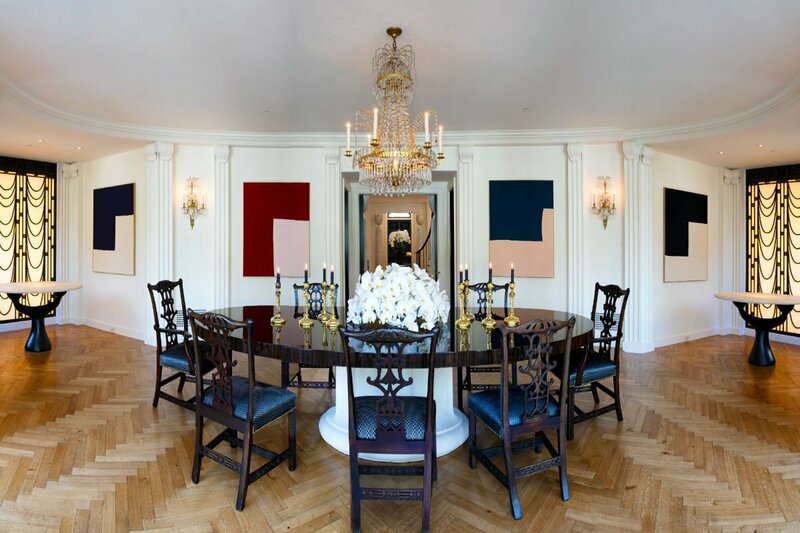 A Look Inside the American "Versailles"
Looking to buy or sell luxury real estate? Receive the latest articles in your email. © 1999 – 2018 Christie’s International Real Estate all rights reserved.